Throughout Shadrach Ricketson’s childhood, the controversy on inoculation was one of the most common arguments between the medical professionals. Inoculation is essentially the process by which you deliberately transfer a disease from one person who is infected to another who is not, with the goal of making that person resistant to the disease and unable to acquire it as some later point in life, when such a condition is more deadly and undesireable. By infecting the individual with the disease in a particular way, and at a particular time in its development and infection of the body of the donor, it is also hoped that the recipient of this treatment will acquire a less infectious form of the condition, making survival a more likely outcome. Such was the case for dealing with small pox, a condition which could result in a severe infection of the body resulting in the production of severe pustules and the like all across the entire surface of the body. The problems with small pox were considerable in Hudson Valley and Dutchess County history due to the incidence of this epidemic-like condition at two levels of severity. The first level of severity is the way in which this disease infected Native American community, individuals who lived in fairly close assocaition with one antoher and who had absolutely no exposure to this sort of disease prior to the arrival of the Europeans. Typically, any contact members of the Native American resulted in numerous deaths, involving people of all ages and gender. For Colonists, the types of epidemics and case clusters that developed in their communites were less fatal at a population level, but fairly devastating at the family and interactive social level. The main problem with small pox within colonial communities is that the disease could infect and kill individuals preiously uninfected by this condition. This meant that if you were a child not yet exposed to the illness, that you could catch small pox and die. If you were an adult without a history of small pox during your earlier years, then you too could catch the disease and leave behind your family and children. Finally, if you were an adult with a history of small pox and so had no worry about catching the disease yourself and dying, you still had the chance of carrying the disease members of your family had and infecting others without a history of the disease, as part of your visit to the local merchant, church, shipping yard, wagon station, or workplace. The inoculation process was a main way that this ongoing diffusion of disease through a community in peaks and waves could be slowed, halted or prevented. A prime example of this problem with communicable disease occured in the Hudson valley during the Revolutionary War years, which began when Shadrach Ricketson was just 9 years of age. The local hospital developed just outside of the Fishkill Village in 1776 was one of the first places where people resided in fairly tight quarters, hospitalized or not. This resulted in an epidemic of the measles in just a few months and some recurring spells of small pox on and off throughout the years of this military campaign. Encampments and hospitals in the Boston area had already been hit by small pox epidemics several times by January 1776. This resulted in the establishment of a smallpox hospital, in order to quarantine soldiers infected by this problem from others in order to avoid an outbreak. At this time, the possibility of inoculating soldiers against small pox was avoiding in order to prevent a much larger epidemic from commencing. This conservative approach to the disease seemed to work for a short while, but in due time, as more cases began erupting sporadically throughout the military encampmments and hospitals, more aggressive actions needed to be taken to prevent small pox from completely immobilizing and dangerously weakening the various armies George Washington had formed. In May of 1776, three soldiers hospitalized for small pox in the New York City military hospital were sent off to the Small Pox hospital for isolation and a prevention of the spread of this infection. This was followed by several requests to begin inoculating soldiers by other field surgeons and physicians within the isolated hospital settings. In one case, such concern for the lack of an inoculation program even led one physician to, against the demands of the Continental Congress at the request of the Chief Surgeon and George Washington, inoculate several soldiers in violation of of this order. He was imprisoned for this action. 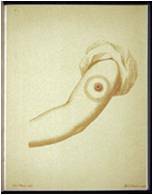 Over the next few months, the recurrence of small pox in small clusters throughout the military establishments made General Washington and his staff rethink their measures taken for the safety of the soldiers, and so finalized the orders to commence an inoculation program by the end of the year. This program wasn’t fully initiated until February of 1777, when even new recruits had to be inoculated before commencing their service. By April of 1777, all of the soldiers and members of the military staff were inoculated with small pox. The death rates related to these inoculations were just four in every 500 inoculated or just under a one percent fatality (0.8%). The continued innoculation of new recruits throughout 1777 and the orders to isolate of anyone infected with small pox followed through by the hospitals all along the Hudson Valley proved that this particular combination of public health practices worked. Inoculation and isolation became the rule of public safety that many physicians were engaged in during Ricketson’s pre-teen-age and teen-age years residing just up river from this setting, in close proximity to the second most important hospital in this region, that which made use of the Quaker church built on Oblong Patent to occasionally service sick soldiers. The difference between inoculation and vaccination is that for the former, you introduce the actual contagion responsible for the illness or otherwise somehow strong suggesting and related to it, whereas with vaccination you use of a particular derivative or substance somehow related to the cause and and effect of the disease, but not necessarily the same causative agent for the disease itself. Throughout most of the Colonial period when inoculation was practiced, the traditional method of inoculating was scraping the diseased tissue and exposing those not yet infected by the same disease to this disease-related form of the “contagion”. The effect of this transmission of contagion to the next body is the development of a similar disease in that person, with hopes of not causing as much a problem as the true disease itself, thereby trying to prevent the fatality that might otherwise ensue. During the initial years of treating small, pox, the differences between the variations in types of pox or scarring that formed (the variolae) had been defined by physicians. It became common knowledge that certain weaker forms of the pox (variolae minor) were more useful and less fatal than other more highly infective forms (variolae major). A much safer method for inoculating was discovered when the scrapings of cow-pox “contagion” on the surface of the skin was used as a replacement for the variolae scrapings taken from an infected person. Medical historians date the initiation of this process of using cow-pox to somewhere around 1770 or 1771, when families residing on dairy farms in England used this method to inoculate their own family members and workers against the disease. At the time, this practice was also engaged in by at least two other farmers, and possibly by members their nearest neighbors during the years of 1774 and 1782. Between 1770 and 1795, this method is known to have been employed by three German cattle raising communites as well in 1770, 1772, and 1791. This suggests that the knowledge of this use of cow-pox as a substitute for true small pox-based inoculations was perhaps already a part of the popular culture settings in some communities. Without knowledge of the microbiological differences between small pox and cow pox, it is easy to see how these individual may have applying applying the methods and theories of small pox inoculation, which they were already learned in or aware of, to other conditions bearing the same presentation clinically. 1799 – Bartow White, son of Revolutionary War Dr. Ebenezer White, and a student of Valentine Seaman from about 1797-1799, removed to Fishkill, and was married. Dr. White’s father, Ebenezer, a surgeon on the Revolution, was a strong advocate of inoculations. Two of Bartow White’s apprentices would be training essentially for positions as surgeons at Fort Dearborn in Illinois (Chicago). This position was established around 1802/3, and the “fort” commenced in 1803. White’s students from Fishkill removed to this fort shortly before the War of 1812 commenced, with one of the two dying due to Indian raids. 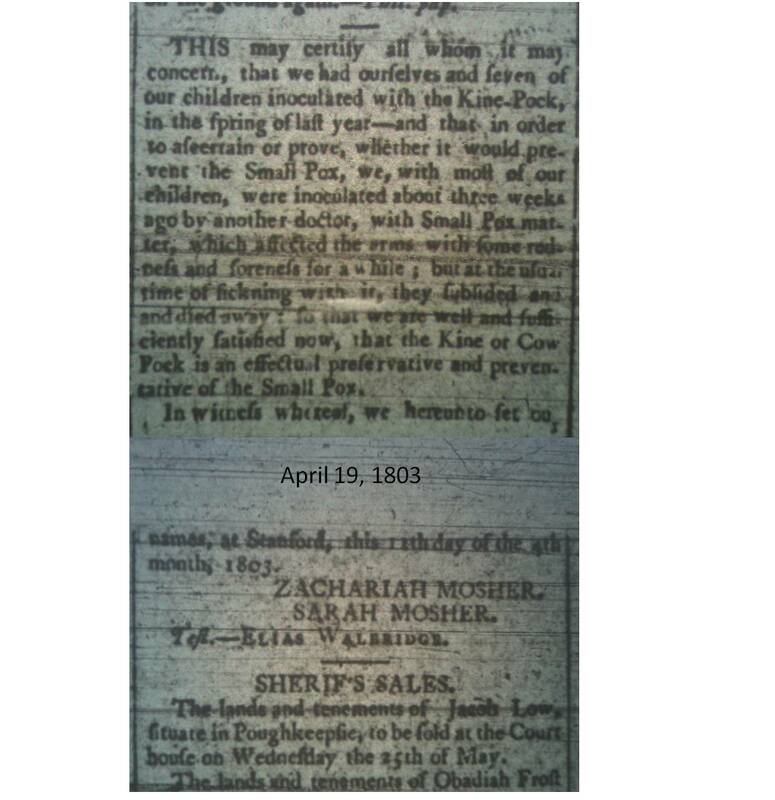 1802 – Poughkeepsie Journal article of 1803 contained a certified document stating the first cow pox vaccines were administered to a family in April 1802. No mention of Waterhouwe is given, but based on Waterhouse’s travels history, he or Shadrach Ricketson may have been directly involved. 1802 – June 2 – Debate on Edward Jenner’s Petition regarding the discovery of the vaccination technique and subsequent Report filed begins at the House of Commons. The Suttons kept secret their plans on how to inoculate against small pox; to prevent this secrecy, Jenner was awarded 30,000 Lbs Sterling as a prize for making his method known to everyone. 133,333 dollars were ultimately rewarded. 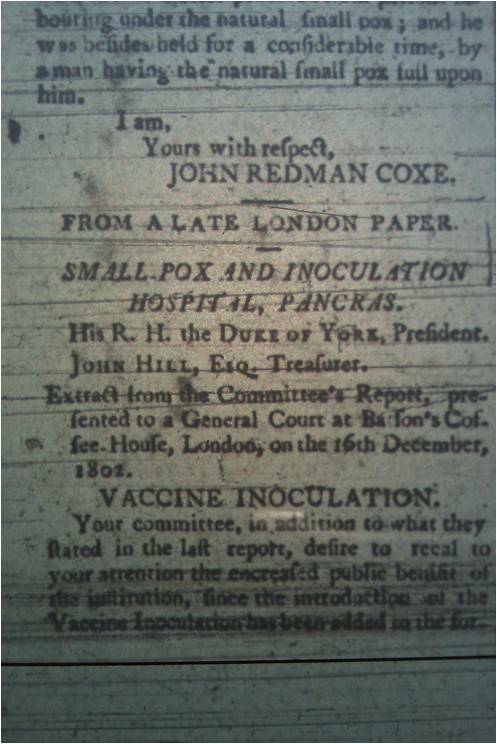 1807 – September 24 – Letter from Jenner to Waterhouse, regarding disputes underlying his claims to discovery of kine-pox vaccination. Waterhouse received a reply dated November 18, 1807 from Jenner. 1808 – March – Randolph town developed kine-pox inoculation program; a detailed study was performed on this process and its success. 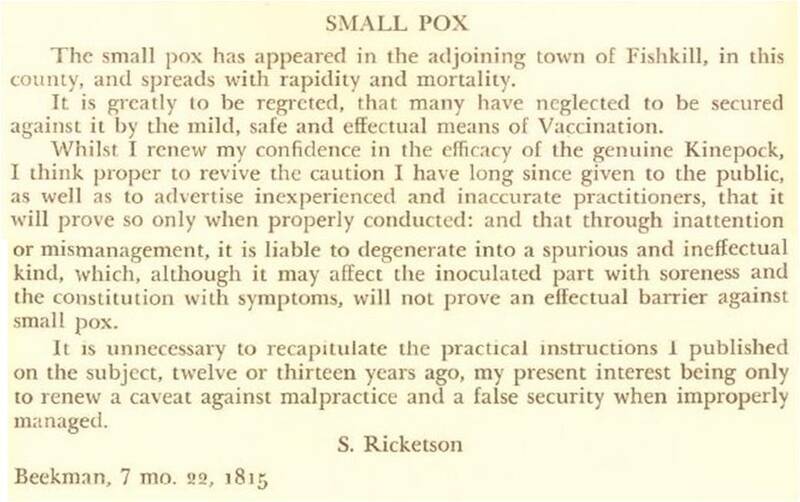 1809 – August-September – Milton, Mass., underwent substantial vaccination testing, involving 337 people vaccinate with kine-pox and then placed in the Pest-house for exposure to small-pox. August-September – 1500 people in New Bedford were then tested by Waterhouse. September – Isaac V. Van Voorhis of Fishkill is in an apprenticeship under Dr. Bartow White; submits an article on his preceptor to Medical Repository, which is published. 1810 – January 25 – a speech is given to both houses by the governor of Massachusetts, supporting the kine-pox vaccine. February 7 – Petition filed by Waterhouse for remuneration. 1811 – May 10 – Isaac V. Van Voorhis of Fishkill performed a study of kine pox and small pox involving people, and horses and other animals. This is published in Medical Repository. By 1800, translations of Edward Jenner’s discovery were produced in several languages and distributed to other countries around the world. This discovery was immediately considered a valuable substitute for the inoculation programs by then being fully implemented. This problem, along with some underlying legal disputes about the origins of this discovery, put the Jenner’s kinepox program through a five to ten year period of testing and change. In many places such as Dutchess County, both methods of immunizing against the pox were being considered and practiced. Being in practice during this period of change, Shadrach Ricketson learned much on how to become engaged in both of the preventive health measures recommended for preventing small pox cases and epidemics. Reviewing this topic for a moment in terms of his Sanative thinking as a Quaker, a form of medical philosophy that bases its values upon the religious notion of abiding by “God’s Will” and the like, in the case of Quaker tradition, such a process for taking the right actions as a physician might require that you make use of the “Quiet” session within a church setting or alone at home. You would in Quaker form meditate and/or pray for your answers, hoping to encourage some form of desired ‘communication with God’. For this time in medical history, while such a dilemma was happening, Dr. Ricketson had to detfine the best sanative approach to treating the illness. Although the answer to this philosophical question was obvious, the logistics of arguing for the use of one immunization process versus the other required that you taken an approach that is not only natural, but also in accordance with Divine Will. To the non-believer, someone not as devoted to this issue as a Quaker or other strongly opinionated theologian, this may mean the discovery of a cure or manner of treatment had to match the expectation defined by the agnostic/atheistic physicians own intellectualism and natural philosophy/natural religion manner of thinking. Ricketson’s support of the inoculation and vaccination programs tells us that he viewed the discovery and use of such procedures as part of the ‘Divine Plan’ according to Quaker tradition and philosophy. It was his role as a physician to heal the sick who have the small pox, just as it prevent was his responsibility to offer his services to valetudinarians to prevent them from becoming even sicker, as well as to souls in his neighborhood in their ‘God-given healthy state’ to enable them to keep this temperament their most important ongoing attribute. Unlike some other (usually very modern) sanative methods in which no intervention by a physician is made as part of the characteristic treatment modality, being a Quaker, Ricketson never performed such a task. The common thought in such a setting to those devoted to Ricketson’s work might state and believe: ‘There is no expectation of an exemption from receiving medical treatment, especially from a Quaker physician!’ Such was Ricketson’s way of dealing with such an otherwise problematic religious dilemma that placed religious and science at opposite ends of a social conflict. The Kine Pock or Cow Pox had become the next important change in Dutch County Public Health history due to Shadrach Ricketson. This use of Kine Pox vaccination was different from that noted earlier by Thomas as Variolae Vaccinae. It was natural for Ricketson to be one of the first to publicize and promote this proven method of improving the local health of the population in the Hudson valley, and in a very Quakerian fashion. The reliance upon Small Pox vaccination techniques has since become a standard for the Hudson Valley-at least for the immediate Poughkeepsie area on northward to the Beekman north edge of the patent area and and the east edge of the Oblong patent where many Quakers had also also settled. More than likely Ricketson’s influences were also carried on down southward along the valley, reaching New York City due to his prior expereinces there as a medical climatologist published by the Medical Repository. This certainty of Ricketson’s efforts and work as a public health educator made it more likely that problems would finally begin to dwindle to some extent with such a fatal epidemic disease brought on by a yet-to-be-identified form of contagion.